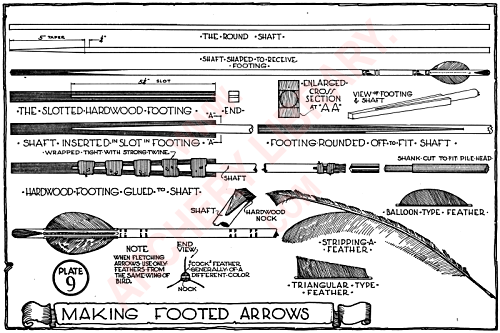 There are various ways to make footed target arrows, but, in the writer's opinion, the following method is the easiest. Assuming that you have a dozen straight 5/16" x 30" Port Orford or imported Norway Pine shafts, and a dozen square footings 3/8" x 8½" long, slot the footings with a hacksaw to a depth of 5¼". See Plate 9. Lay them aside. Taper the ends of your shafts with the flat of the grain, beginning 5" from the end as shown. The footing is slotted 5¼" and the extra ¼" will help you to plane your square footing round with the round shaft. The taper should go down to a feather edge. See that each taper fits a footing. Apply casein glue liberally to the taper and inside the slot. Push the taper into the footing, as shown, and bind tightly with rubber strips cut from an inner tube. Look down your shaft and line up your footing with it, so that the footing and shaft is absolutely straight. While the glue is wet this can easilv be done with the fingers. Let the footings and shafts dry for a day-two is better, and with a sharp block plane round the square footing to the same size as the shaft. If you buy round footings, it is a simple matter to work down the prongs to the shaft. Study Plate 9. After you have your footings rounded down and all straight with the shaft, put on your heads, and cut off all your shafts to the length that fits your bow. Inlay your nocks as shown on Plate 8, being sure to cut with the grain lines, so that you may finish your nock across the grain. Fletch your shafts with balloon feathers and finish up the same as you would self arrows.